For those who like to make their own supplement formulas, we now offer “00” sized vegetable-based capsules! A vegan alternative to the standard gelatin-based capsules, these are free from animal ingredients and are perfect for making your own supplements from herbs, vitamin powders or anything else you need. 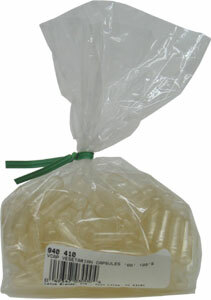 Each bag contains 100 capsules. $3.99. From Maggie Williams of Alliance, Nebraska on 3/30/2011 . These gel capsules are cruelty free, vegan, and at an awesome price. I use them to replace gelatin medicine capsules and sometimes I put herbs in them. Pleasing mild taste and digestible. From Josh M. of Lacey, Washington on 8/30/2009 . These are great capsules, and much cheaper than the price at our local food co-op. From Anonymous of queens, New York on 1/17/2008 .